The Spite House stands at 44 Hull Street in Boston's North End. It is a tiny house with a fascinating story. Legend has it that it was built around 1800, out of spite. The owner built it in an alley, to block the big home behind it that his parents had given to his luckier siblings. You'll notice that the Spite House has no front door. You must enter by a side door down a narrow walkway [what's left of the alley] to get inside. 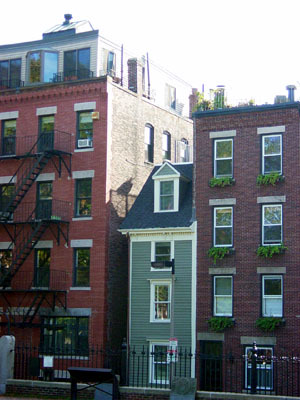 The Spite House averages a mere 9.5-feet wide. In 1980, the Spite House's then-current owner was looking everywhere for a new Queen-size mattress and bed to sleep on. He faced a insurmountable problem: no Sealy, Serta or Simmons set would fit up his narrow staircase. So he came to Bedworks. We suggested a flexible foam mattress with a 20 year warranty, and we crafted our Queen Floating Platform bed for him in three pieces, each no bigger than 27" x 62" x 3". Our platform bed and mattress fit up his tiny staircase, where no box springs or innersprings would. Now he finally could enjoy a good night's sleep! The Spite House stands at 44 Hull Street in Boston's North End. FYI: Boston luckily does not hold the record for the narrowest house. 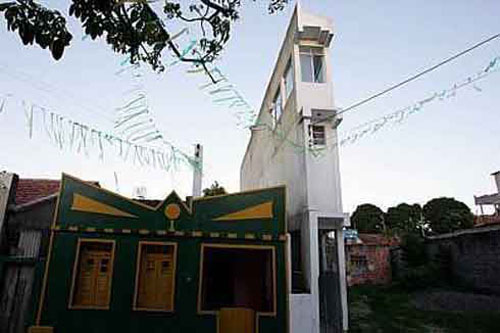 The narrowest house in the world is in Brazil. It is only 40" wide.  A wikipedia page about this very house.  Living Sideways by Jim Cronin, Boston Globe, Feb. 13, 2005.  "9 Houses Built Just For Spite" By Virginia McGuire, Mental Floss, Oct., 2015.  "Take a Peek Inside Boston's Legendary 'Skinny House'" by TomAcitelli, Boston Curbed, Feb. 24, 2015. "I love this place. We have been coming here for 20+ years."